A branded TalkingCV account will give you control via the customised structured interviews and with options to integrate with existing ATS/CRM systems through the API you can have one seamless system. 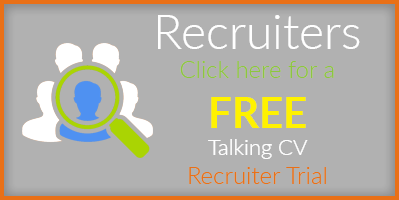 A branded TalkingCV Recruiter site enables you to manage the candidate interview process and build a powerful Candidate database of video interviews and profiles. The Recruiter can determine the interview they wish the candidate to sit, with an automated email sent to the candidate with access details to a professional, branded website. Once the candidate has completed their interview an email is sent to the recruiter with the URL link to their personal TalkingCV. These TalkingCV candidate interviews can then be shared with any potential employer or interview panellist to view. 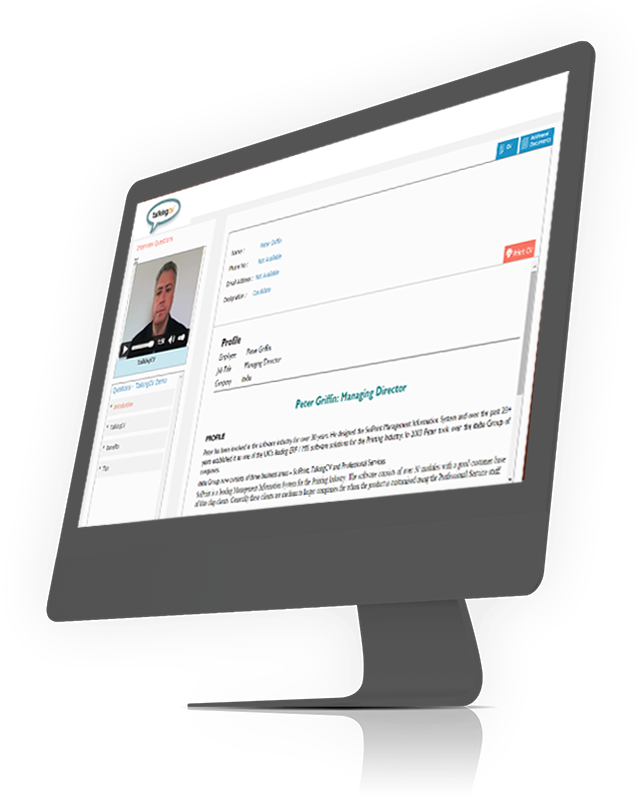 Our Corporate version allows for Evaluators to view recorded interviews, providing feedback and scoring. The overall candidate interview is scored with question difficulty weighting and graphical analysis provided for the advertised position. Dashboard reporting provides real time performance analysis of both Candidates and Evaluators. Proctoring and candidate activity logs enable a controlled interview process regardless of candidate location. 3D Studio also provides the ability to produce internal Help, Induction or Job profiles. TalkingCV is a revolutionary 3 Dimensional Personal Profile consisting of video, audio and text. In an increasingly competitive job market TalkingCV will make you stand out from the crowd! Using an internet-enabled PC with webcam or a mobile device, candidates can record a structured video interview reply to your pre-set questions, with each candidate provided with the same time in which to answer them. Each video interview is then allocated its own unique URL link meaning you are able to share publications with clients and members of your recruitment panel – anytime – anywhere.